How does climate change impact potato production systems and farmers’ livelihood in the Andes? We explore these questions as member of the SIMPATICA (Systematic in situ Monitoring of Potato Agro-diversity under Climate Change in the Andes) project, led by the International Potato Center (CIP) in Lima, Peru. The project is funded by the German International Cooperation Agency (GIZ). Due to its geographical conditions, Andean agriculture is highly heterogeneous. Most farmers are subsistence farmers who have several small parcels at different altitudinal levels with various microclimates. These Andean microclimates are the origin of thousands of potato landraces that have been cultivated for more than 7000 years at 3000-4200 meters altitude. Apart from potatoes, farmers also cultivate a large range of other crops and crop varieties such as maize, barley and alfalfa. Each of these crops is well adapted to the different environmental conditions and has very specific agronomic traits. When farmers plant various (traditional or landrace) potato varieties, this is also called in-situ conservation. This strategy of planting diverse landraces has been found to enhance food security and crop system resilience. It is used globally as an effective smallholder farmers’ insurance policy to respond to biotic and abiotic stresses and to buffer environmental variability. 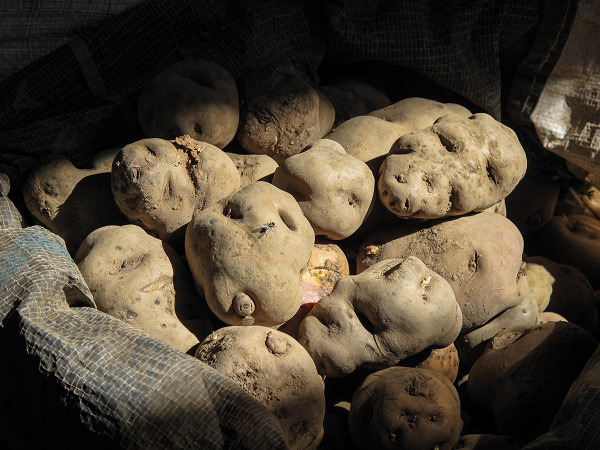 As each potato variety has specific agronomic traits regarding quality, potential usage, disease susceptibility, cold tolerance, etc., planting different potato varieties is an ancient and powerful adaptation strategy for smallholder farmers in the Andes. To assess the farmers’ current usage of potato diversity and to analyse its development in the future, the CIP team interviewed many famers and created a comprehensive household survey which will be used as a baseline for further analysis. HFFA Research’s work within this project focused on quantitative data analysis. Our team member Sophia Lüttringhaus advised project members on how to create a baseline that would allow to assess developments over time. She also developed an econometric model to analyse farmers’ socio-economic and cultural incentives and disincentives for potato diversity. An open access baseline data base was published as one of the outputs of this project.